Adaptation of the novel by Frances Hodgson Burnett. When Mary Lennox is orphaned while living in India, she comes to live at her uncle’s manor house on the Yorkshire moors, finding it full of secrets. At night, she hears the sound of crying down one of the long corridors. Outside, she meets Dickon, the brother of one of the housemaids and a magical boy who can charm and talk to animals. 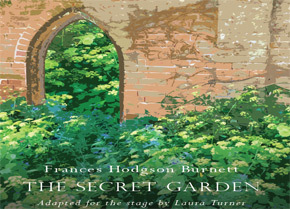 Then one day she hears about a garden in the grounds of the Manor that has been kept locked and hidden for years. And when a friendly robin helps Mary find the key, she discovers the most magical place anyone could imagine . . .
First performed by Chapterhouse Theatre Company, National Tour 2015, directed by Philip Stevens.